Home | The Southern Marin Mothers' Club Celebrates 25 Years! The Southern Marin Mothers' Club Celebrates 25 Years! 25 years ago, an incredible group of women had the vision to start a club for young mothers in Marin. The Southern Marin Mothers' Club (SMMC) was born, and from the beginning provided a valuable sense of community and a deep well of resources for mothers (and dads, too!) and their young families. This commitment to community and connection continues today, and the SMMC now has over 1250 members (and growing)! The SMMC offers its members friendships, amazing parent resources, an online forum with nanny and babysitter recommendations and more, classifieds for when you're ready to part with all that baby gear, over 100 playgroups for all ages, a full calendar of family activities, the SMMC Crier magazine, a community discounts program, a meal delivery service for members with new babies, and philanthropic programs that help give back to the community. Activities include three big yearly events: a Summer BBQ, Preschool Fair, and Parents' Night Out/Casino Night. Other activities include a monthly socials, community playdates, educational seminars, and webinars exploring parenting topics like "Burnout to Balanced." You don’t need to be the parent of a newborn to join the SMMC. The School Years subgroup offers fun activities and events for families kids well into grade school. This subgroup of nearly 400 members provides help, support and resources designed especially for parents of school-aged children (ages 4 to 18). The School Years team puts on multiple events each year that mix parental education and family-oriented events. Events include parenting education talks, a family overnight, workshops on re-entering the workforce, a private school fair, and kids’ volunteer opportunities. To learn more about SMMC and join the club, visit southernmarinmoms.com. Scholarships are available for those in need. 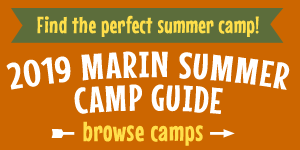 Browse events and activities for families in Marin and the Bay Area.